George Frost Kennan remains a name to be reckoned with, even beyond the world of American international relations and diplomatic history (or as today’s historians say, “America in the world”) where he made his primary mark. Generations of foreign affairs and history students came of age reading Kennan’s crisply written American Diplomacy (1951), and no American history survey is complete without citing Kennan’s most famous achievement: formulating the policy of “containment” of the Soviet Union in the early days of the Cold War. While there is an extensive literature on Kennan’s influential role in US foreign policy, John Lewis Gaddis’s weighty biography is the first scholarly treatment of Kennan’s life. Not only is it the first, George F. Kennan: An American Life (Penguin Press HC, 2011) well deserves the label “definitive.” This is because in 1981, at the age of seventy-eight, Kennan gave Gaddis, one of the most prominent American diplomatic historians, access to all his personal papers, letters, and even his diaries, and encouraged him to write an authorized biography, to appear after Kennan’s death. What neither Gaddis nor Kennan anticipated, though, is that while Gaddis worked on the book Kennan would live on and on... and on—until 2005, when he died at the age of 101. As Kennan lamented in 2003, in his characteristic way, “My unnatural longevity is now becoming a serious burden to others. Poor John Gaddis has seen his undertaking being put off for years while he waits for me to make way for it.” Gaddis even learned that his students at Yale were betting on which of the two of them would die first. The book’s long gestation meant that Gaddis became deeply immersed for decades in his subject’s contemporary as well as his earlier life. Even though Kennan made no effort to control or read anything Gaddis would write about him, Gaddis at times exhibits some irritability and frustration with his subject, as if he and Kennan had spent too many hours together on a long road trip. Nevertheless, the biography is a highly engaging read. Gaddis’s account of Kennan’s childhood and youth indicates the unusual combination of personal confidence and doubt that appeared throughout his life. Kennan was born in 1904 in Milwaukee into a modest, well-educated middle- class family of Scotch-Irish Presbyterians. George F. Kennan’s father, Kent Kennan, was a tax attorney and a sensitive but emotionally distant man. His mother, Florence (James) Kennan, died of a ruptured appendix a few months after his birth. George long believed she had died as a result of his childbirth. 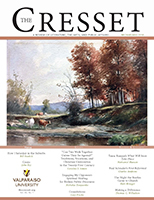 This maternal absence, combined with a generally repressed home atmosphere and Kent’s remarriage to a woman who took little interest in his children, meant that the sensitive, observant George had few emotional outlets other than his sister Jeanette, who became his lifelong intimate correspondent and sounding board. He also found intense pleasure and release during summers at Lake Nagawicka, west of Milwaukee, where his deceased mother’s family maintained a home; it was there that George developed his love of the natural world and his acute feeling for its every mood and detail. Gaddis does suggest the connection between Kennan’s motherless childhood and his lifelong feelings of displacement, longing, and loss—though a more psychologically penetrating biographer might have made even more of this than Gaddis does. A brilliant student of languages and ­literature—already fluent in German by the time he left for college—Kennan was something of a middle class outsider at wealthy 1920s Princeton, which another Midwesterner, F. Scott Fitzgerald, had recently described as “the pleasantest country club in America.” Though Kennan soaked up the academic opportunities at the Ivy League college, his rejection by the exclusive “eating clubs” meant that he took his meals with the other “rejects,” another experience that contributed to his sense that “one had to make one’s own standards; one could not just accept those of other people.” It was partly to explore his “own standards” that Kennan began keeping the keen, introspective, lifelong diaries that he eventually drew on for the rich, imaginatively powerful Memoirs, 1925-1950 that he published in 1967. These diaries are also a critical source for Gaddis, though he argues that Kennan often distorted or exaggerated events, and sometimes his own feelings, for emotional or literary effect. After a nearly penniless summer tramp across Europe with a Princeton friend, Kennan decided to enter the US Foreign Service as a junior officer in 1926. Funded by the State Department for graduate study in Berlin, Kennan became fluent in Russian and then spent several years in the “listening post” on the Soviet Union in the American embassy in Riga, Latvia. When Franklin Roosevelt finally established diplomatic relations with the Soviets in 1933, Kennan assisted the first American ambassador, William Bullitt, in the difficult task of opening the US embassy amidst the harsh conditions of Stalin’s Moscow. The young Kennan was thus already the State Department’s foremost Russian expert, and the rest of his professional career would be closely bound up with the stormy course of US-Soviet relations. While Kennan certainly served his superiors well by analyzing Soviet politics and policy in the conventional mode, he also soon developed a feeling for the Russian language and the Russian people far deeper than any ordinary diplomat’s. He steeped himself in Russian literature, from Pushkin to Pasternak, and despite the tight controls on US diplomats managed to engage in substantial travel around the country. When Kennan returned to Moscow in 1942 after diplomatic stints in Prague and Berlin (during World War II but before the US entry in 1941), his deep knowledge of the country as well as of Stalinist policy and behavior enabled him to see through the naïve perspectives that many Americans, including Franklin Roosevelt and wartime Ambassador Joseph Davies, promulgated during the US-Soviet alliance against Nazi Germany. It was Kennan’s “long telegram” of February 24, 1946, followed by a similar article in Foreign Affairs (signed “Mr. X,” since Foreign Service officers were not allowed to write publicly under their own names) that propelled Kennan to fame, first within the government and then beyond. Kennan’s astute and forceful analysis of Stalin’s Communist state and ideology as simultaneously expansive and yet fearful, along with his penetrating advocacy of a firm but not aggressive American response to meet and “contain” Soviet power until it could be transformed from within, laid the essential theoretical foundations for US policy from the late 1940s until the collapse of Communism and the dissolution of the Soviet Union in 1991. 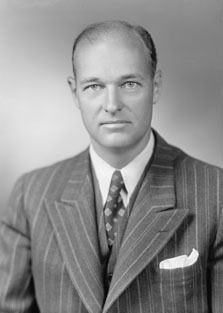 After returning to Washington, Kennan worked extensively on the Marshall Plan that revived the economics of Western Europe, became head of the first State Department policy planning staff, and then served briefly as US ambassador to the USSR in 1952 until he was expelled by Stalin himself. As high as he rose in the foreign policy establishment, and as much as he enjoyed his influence there, Kennan innately resisted institutional groupthink and maintained his own prickly independence. Even though firmly anticommunist, he became increasingly disillusioned with the thrust of America’s Cold War policies—policies that, as many critics, including Gaddis, point out, he himself had played a large role in developing. By the early 1950s Kennan insisted that he had always intended containment to be primarily a political, not a military strategy, as it largely became under NATO. Kennan also began publicly advocating what he had first proposed internally as “Plan A” in the late 1940s: negotiations with the Soviets for joint military withdrawal from divided Germany and the creation of a unified, neutral German state between the two Cold War military blocs. (This proposal was not as far-fetched as it later seemed. It initially had considerable credibility inside the State Department and was what did happen in 1955 in the case of jointly occupied Austria). Kennan’s public advocacy of this policy infuriated his former boss and onetime friend, Truman’s Secretary of State Dean Acheson, and made Kennan persona non grata in many Washington circles. Gaddis is at his best, and his expertise as a Cold War historian most evident, as he details these debates and sets them within both historical and contemporary contexts. While Gaddis never uses the term “conservative” to describe Kennan, he should have, since it is evident that Kennan—always an intellectual elitist—had become increasingly disaffected from the moralizing, blustering, and often militaristic posturing in Europe and around the world that many Cold Warriors displayed. That its attentions are unwanted? But it is Kennan the man, the writer, and the person of faith, even more than Kennan the diplomat and theorist of international relations, who proves most fascinating. And it is here where Gaddis’s biography, highly informed and competent as it is, fails to take Kennan’s full measure. Even when Gaddis provides abundant research and informed analysis, he has trouble plumbing the depths of his unusual subject. Gaddis is a fine historian and a good writer, but it would take a different kind of biographer, one with greater literary and psychological insight, to paint a richer portrait of George Kennan. Personally, Kennan was a complex and compelling character. Steeped in an ethic of Midwestern and Calvinist conventionality and aspiration, he craved professional achievement and recognition and outwardly succeeded beyond his dreams. Yet his own constant self-doubts and intensely emotional mood swings—perhaps rooted in his motherless childhood—led him to develop a rich and unconventional inner life that far exceeded those of most men or women of affairs, much less ordinary State Department bureaucrats or establishment grandees. Toward the end of his life, Gaddis reports, George Kennan reflected that he should perhaps have been a writer rather than a diplomat. In fact, he was both. He eventually won two National Book Awards, one for the first volume of his compelling history Russia Leaves the War (1957) and for his Memoirs, 1925-1950 (1967), and he published other fine histories. Although these books were history and memoir rather than the imaginative fiction that Kennan might have produced, they brought to these genres the lyrical, literary gifts that Kennan had earlier deployed primarily for his own satisfaction. The high northern latitude, the extreme slant of the sun’s rays, the flatness of the terrain, the frequent breaking of the landscape by wide, shimmering expanses of water: all these combine to accent the horizontal at the expense of the vertical and to create everywhere the sense of immense space, distance, and power. The heaven is vast, the skyline remote and extended.... At every hand one feels the proximity of the great wilderness of the Russian north—silent, somber, infinitely patient. And has there been any other American diplomat, besides perhaps John Hay, who could, during a long transatlantic flight home after an exhausting conference in postwar Germany, write a poem like this? To find the fragments of an empty ocean. To see his darkness passing like the night. And has contrived to touch the gleaming hem. Finally, there is Kennan’s religious life. The spiritual dimension of Kennan’s experience and outlook on the world plays only a small role in Gaddis’s biography, and Gaddis makes relatively little of it. 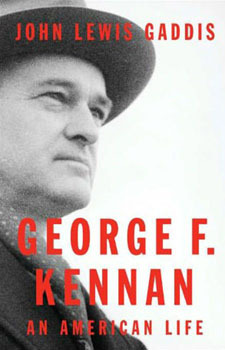 Yet many of Kennan’s finer qualities, especially his caution about overweening power and his keen attention to the human consequences of diplomacy and relations among nations, can be connected to his Christianity. Unlike some Christians who have presented themselves in public life in recent decades, Kennan felt no need to proclaim his or his nation’s righteousness. And in fact he believed that much of America’s often noisy assertion of its own singular virtue and purity abroad constituted a national counterpart of the pride that goeth before a fall that Scripture warns of. Part of Kennan’s success as a policy analyst, at his best, was his ability to understand and empathize with other peoples, no matter how ugly their behavior or alien their outlook. One of the reasons he believed that steady pressure, not threats or aggression, was the way ultimately to alter Soviet policy was his informed conviction that the ­country’s Communist ­rulers did not really reflect the true Russia’s deepest moral and spiritual qualities—and that these would eventually reassert themselves if given time. In another instance, assessing the Chinese Communists in the 1960s, Kennan soberly took note of their fanatical ideology, their brutality, and their hatred of Americans and Westerners, but then said that the United States should not be “the avenging angel of all humanity.” America should not forget that the Communists, for all their cynicism and cruelty, were only human, that they had “mothers and children and affections.” Like all people, they were what their circumstances had made them, Kennan argued, and new ­circumstances—including the combination of Western pressure and negotiation—could determine what they, or their successors, could become. Such perspectives, of course, are not uniquely Christian, or religious. And Kennan would have been horrified by any proposal for a “Christian foreign policy” for the United States. 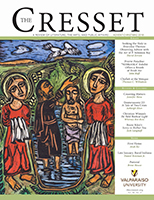 Yet amidst the swirling and often horrific currents of the times in which he lived, and amidst the hubris of many of his own fellow citizens trumpeting “the American Century,” George F. Kennan demonstrated how qualities that often find their deepest roots in a transcendent faith can serve the practical good of both nation and humanity. 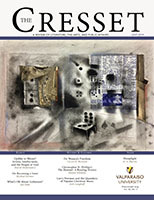 Mel Piehl is Dean and Professor of Humanities and History in Christ College, Valparaiso University.